That Council enact a by-law to change the name of Caledon Place between Industrial Avenue and Terminal Avenue to "Sandford Fleming Avenue". Que le Conseil adopte un règlement en vue de changer le nom de la place Caledon à « avenue Sandford Fleming » entre les avenues Industrial et Terminal. 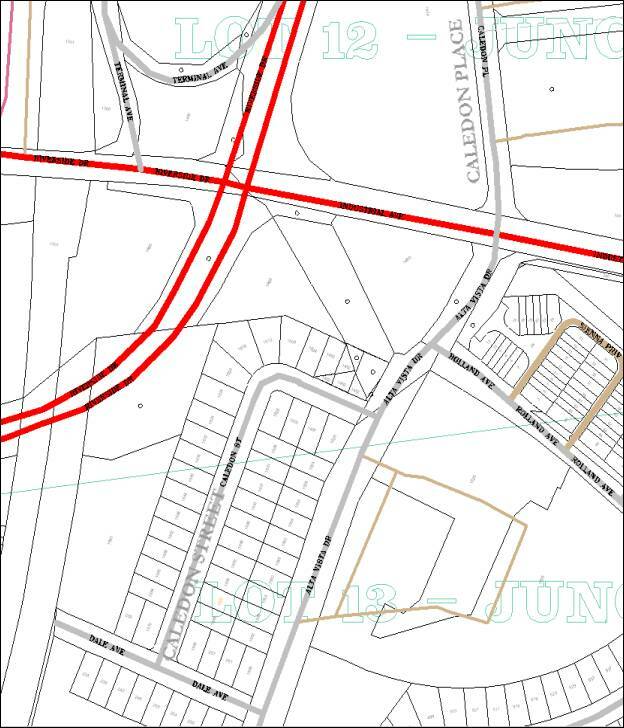 That the Planning and Environment Committee recommend Council enact a by-law to change the name of Caledon Place between Industrial Avenue and Terminal Avenue to "Sandford Fleming Avenue". Que le Comité de l’urbanisme et de l’environnement recommande au Conseil d’adopter un règlement en vue de changer le nom de la place Caledon à « avenue Sandford Fleming » entre les avenues Industrial et Terminal. On January 12, 2005, City Council approved a work program directing that a number of existing street names be changed to address anomalies that impede effective way finding and emergency response. Caledon Street/Caledon Place was one of the initial streets identified as a priority for remedial action. Caledon Street and Caledon Place, while in close proximity, are physically divided and not readily visible from the other section. This situation has created confusion, primarily for the residents on Caledon Street, for emergency services, for mail trucks destined for the Post Office and for delivery services and for the general public. On September 17, 2004, the residents on Caledon Street, through the Councillor's office, submitted a petition signed by the majority of residents, including some residents living on Dale Avenue, requesting that the street name Caledon Place be changed due to ongoing confusion between Caledon Street and Caledon Place. By applying the standard evaluation guidelines with the principal objective to select the street name change that would result in minimal impact, with the number of residents, businesses and public sector agencies utilizing the existing Canada Post address on Caledon Place, the Department's initial recommendation was to change Caledon Street. This position was conveyed in a letter to the residents on Caledon Street. The residents responded strongly opposing the recommended change to Caledon Street, stressing the emotional and historical attachment to the existing name. Following a meeting with representatives for Canada Post, Councillor Hume and the Department to review the concerns expressed by the residents, Canada Post indicated that, while there would be a significant amount of work associated with changing the name Caledon Place, in consideration of the community's concerns, they were prepared to accept the decision of City Council. The land adjacent to this street is owned by Canada Post, the Federal Government and the City, with approximately 6 business tenants that would be affected. In response to the technical circulation, no comments were received from the other owners and business tenants. The name submitted by Canada Post, "Sandford Fleming", is in commemorative recognition of Sir Fleming, who, amongst many other accomplishments, designed the first postage stamp (the red Three-Penny Beaver). The proposal was referred to the Commemorative Naming Committee for review and approval against the established commemorative naming guidelines. The Department therefore recommends changing the street name Caledon Place to "Sandford Fleming Avenue". In addition, the recommended effective date of the by-law is January 15, 2007, to offset costs related to utilizing/exhausting existing printed material, to provide a reasonable time period for notification and to coincide with the printing of the next telephone directory. That Caledon Street on the north side of Industrial Avenue at Alta Vista Drive be renamed. The similarity in name has caused emergency vehicles to be misdirected and overdue. Large commercial vehicles frequently end up erroneously in our quiet residential area. The short-sighted initial decision to adopt the name Caledon Place adjacent to Canada Post some 20 years ago is more than mere inconvenience - this is a safety matter that requires an immediate remedy. The Train Yards "big box" mall proposed along the eastern side of Caledon Place is poised to exacerbate this already unfortunate situation. The undersigned strongly support replacing the name Caledon Place to avoid future confusion and misdirection that could result in dire consequences for the resident of Caledon Street and Dale Avenue. On April 4, 2005, the Department responded to the residents and businesses on Caledon Street and Caledon Place, indicating that submissions would be considered in the context of the Council directive of January 12, 2005, the established street name change guidelines, as well as, the impact on those affected on both sections of roadway. On June 7, 2005, Canada Post provided a comprehensive breakdown of the impact to each group/department that conduct business at 1424 Caledon Place (available on request). A second letter dated September 19, 2005 provided to the residents of Caledon Street, explained the significant impact on Canada Post, their business contacts and the public at large utilizing this facility, and that, based on the evaluation criteria, the preferred action was to change Caledon Street. A second petition dated September 21, 2005 signed by 21 individuals living on Caledon Street, reiterated the concerns expressed in the first petition and discounted the Canada Post submission. Councillor Hume and Departmental staff representatives met with Canada Post to discuss the concerns expressed by the residents and to determine if there would be flexibility within Canada Post to support a name change for Caledon Place. Canada Post indicated that, while there would be a significant amount of work involved in changing their municipal address, in the interest of the community they were prepared to accept the decision of City Council. As set out in the City Council report to resolve identified street name anomalies, the existing two street sign blades will be replaced at an estimated cost of $200.00, and will be absorbed within the Public Works and Services budget for the ongoing maintenance of street signs. Available on Request: - First petition/rationale from residents of Caledon Street. - Second petition/rationale from residents of Caledon Street. - Canada Post breakdown of work to accommodate a name change. - Historical background related to Sir Sandford Fleming. Planning and Growth Management Department to notify the affected businesses, emergency services, the primary utility companies, IT, Government and identified business agencies of Council's decision. Office of the City Solicitor to draft and table the implementing by-law for City Council approval with the effective date January 15, 2007. Public Works and Services on request from the Planning and Growth Management Department to arrange for the manufacture of required street name signs with installation on the enactment date.